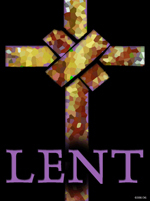 Click here for our Lenten Purple Sheet with more ideas to make this a great Lent. Denying or limiting oneself of food reminds us of our dependence on God and God’s infinite care for us. Thus it also compels us to remember and to help those who fast not by choice or religious obligation but by lack of food and resources. During Lent, those of age 18 until the beginning of their 60th year are obligated to observe a day of fasting on Ash Wednesday and Good Friday. Fasting means eating only one full meatless meal per day. Two other meatless meals, sufficient to maintain strength, may be taken, but together they should not equal a full meal. Liquids, including milk and fruit juice, may be taken between meals. If health or ability to work is affected, one is not obligated to fast. On other weekdays of Lent, eating more modest meals is also strongly recommended. Abstinence from meat is observed on Ash Wednesday and all Fridays of Lent. All the faithful are bound by Church law to abstain from meat on these days from the day after their 14th birthday. Pastors and parents should ensure that children who are not bound by the laws of fast and abstinence are catechized in an authentic sense of penance, conversion, and reconciliation.